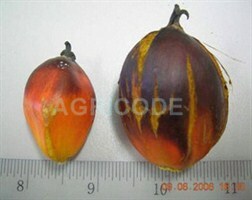 Sample of Super oil palm already been sent back to Taiwan and using for tissue culture. 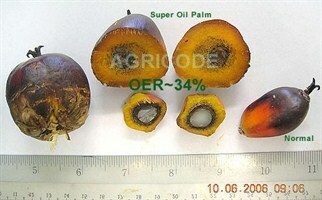 Two diagrams above showed the variety called as "Super Oil Palm" which undergoing mass-propagation by tissue culture technique with Taiwan R&D team. 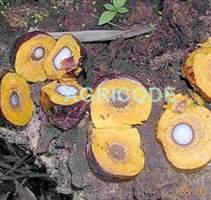 This variety was found in a 20,000 acres plantation at Sabah, we only manage to get 2 oil palm sample out of 1.1 million of oil palm which fulfilled our criteria of research. 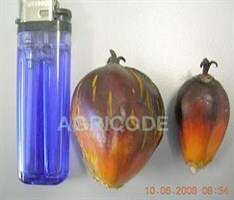 In the diagram the fruitlet which label as "normal" is consider M size for other oil palm fruitlet sizing. 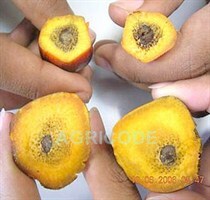 It is about 34 % difference in terms of size if compare the normal fruitlet to the Super Oil Palm, however, their different in terms of oil content is nearly 100 %.